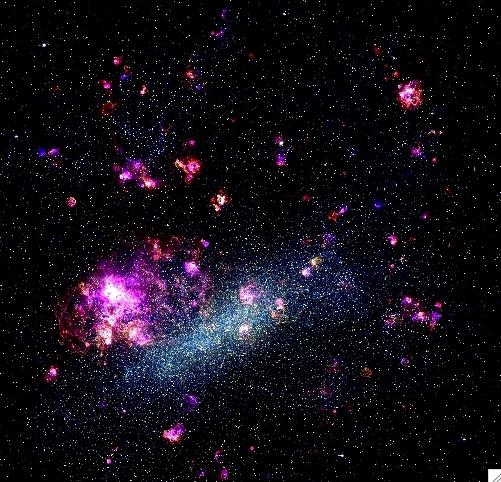 The FUSE Magellanic Clouds Legacy Project provides a Quick Look capability for scientists interested in the stellar and interstellar characteristics of the Magellanic Clouds, as discernible from the high resolution far ultraviolet spectral data obtained with the Far Ultraviolet Spectroscopic Explorer (FUSE) satellite. FUSE observed the 905 -1187 Ångstrom region with a spectral resolution of ~20,000, corresponding to a velocity resolution of ~15 km/s, depending on exact wavelength. Click on either image to see overview images showing the distribution of FUSE sight lines across each galaxy. Over its eight years in operations, FUSE was used to observe 187 hot stars in the Large Magellanic Cloud (LMC) and 100 hot stars in the Small Magellanic Cloud (SMC). 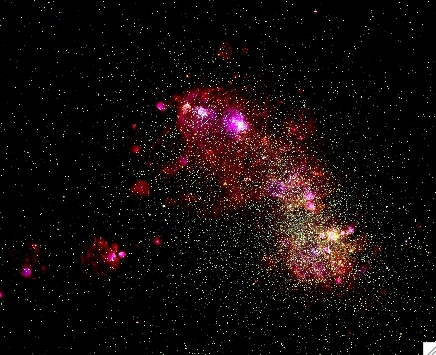 Each FUSE spectrum contains a wealth of information, from the spectrum of the star itself to a broad range of interstellar absorption lines from both hot and cold gas, often at both rest velocity (from the Milky Way) and at the redshifted velocity of the appropriate Magellanic Cloud. Sifting through this complex mountain of data can be a daunting task for researchers interested in a particular science topic. In the links below, we provide access to a broad range of summary information for each FUSE target, to support the analysis of these data for a wide range of potential science programs. The FUSE data for all objects have been reprocessed with CalFUSE 3.2, the archival version of the FUSE calibration pipeline software. The pipeline software is described in detail by Dixon et al. (2007,PASP,119,527). For each star, the FUSE data are shown in several standardized ways, highlighting a key set of interstellar absorption lines on an aligned velocity scale, showing a broader spectral section from 1028 - 1042 Ångstroms that highlights the important O VI 1032 Ångstrom region, and a compressed overview of the entire FUSE band that highlights the general characteristics of the stellar spectrum. In addition, the summary page for each object includes optical and infrared sight line context images, allowing further insights into the characteristics of each sight line. The optical data are from the Magellanic Cloud Emission Line Survey (MCELS) project, and the infrared images are from the Spitzer Space Telescope, with LMC data from the SAGE Survey of Meixner et al. and the SMC data from the S3MC Survey of Bolatto et al. Several search options are available to begin your adventure! Overview Images - This page presents overview images of each Magellanic Cloud with the positions of FUSE targets of various types (O, B, and WR/misc) shown as color overlays. README file - This link provides more detailed information about the data products and processing used to create the information shown in the FUSE Magellanic Clouds Legacy Atlas. How to Navigate this Site - We provide a navigation guide with examples of the data products and a description on how to find your way around.